Many wild animals are born during the spring and summer months. In your own back garden, you may come across baby rabbits, squirrels, deer, and other young wildlife as they make they make their way into the world. For many people, the pleasure of seeing these young creatures is mixed with a sense of protectiveness—of wanting to help them survive. But spotting a baby animal by himself doesn’t necessarily mean he’s an orphan. Many wildlife parents leave their young alone during the day, sometimes for long periods. The mother is usually nearby and quite conscious of her young. Also, keep in mind that despite their small size, many young animals are actually independent enough to fend for themselves. Wild animals can suffer greatly through being handled and this should be avoided unless absolutely necessary. Some young animals appear injured when they’re not. If the animal has none of the above signs, he may be healthy. Is the Animal Really an Orphan? The Louth SPCA often receives phone calls about orphan animals that aren’t really orphaned at all. Many young animals may appear to be orphaned, but actually may be doing just fine on their own. Determining whether or not an animal is an orphan depends on the animal’s age and species, and how you may perceive their natural behaviors. Here’s more information on the young of species you may encounter, to help you decide whether or not they need to be rescued. 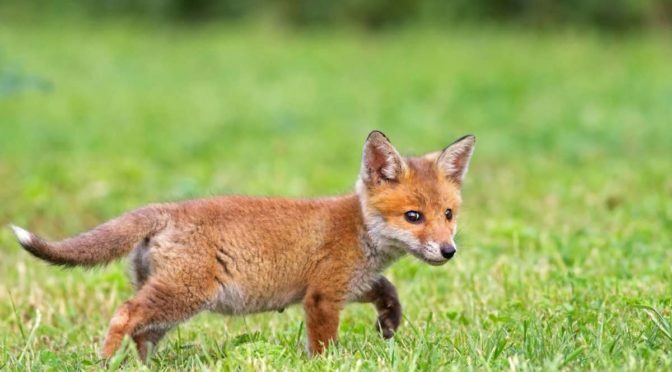 Often fox kits will appear unsupervised for long periods of time while their parents are out hunting for food. Observe the kits from a distance; if they seem energetic and healthy, just leave them alone. Only contact a wildlife rehabilitator if the kits appear sickly or weak, or if you have reason to believe both parents are dead. If you find a nest of baby rabbits and the nest is intact and the babies uninjured, leave them alone. Mother rabbits only visit their young 2-3 times a day to avoid attracting predators. If the rabbit nest has been disturbed, or if you think the babies are orphaned, recover the nest with surrounding natural materials such as grass and leaves. Put an “X” of sticks or yarn over the nest to assess if the mother is returning to nurse her young. If the “X” is moved but the nest is still covered by the next day, the mother has returned to nurse the babies. If the “X” remains undisturbed for 24 hours, contact a wildlife rehabilitator near you. Keep all pets out of the area, as they will surely find and kill the young rabbits. Also, try not to touch the babies, as mother rabbits are very sensitive to foreign smells and may abandon their young. A rabbit who is four inches long with open eyes and erect ears is independent from his mother and able to fend for himself. If tree work was recently done and the nest or baby fell down as a result, give the mother squirrel a chance to reclaim her young. If the baby is uninjured, leave him where he is, then leave the area and keep people and pets away. Monitor from a safe distance. If the baby is not retrieved by sundown, contact a local wildlife rehabilitator. If it’s chilly outside, or the baby isn’t fully furred, place him in a shallow box with something warm underneath (like a heating pad on a low setting or a hot water bottle) so he doesn’t get cold and compromised while waiting for his mother to return. Do not cover the squirrel with leaves or blankets, as the mother may not be able to find him. Note: A squirrel who is nearly full sized, has a full and fluffy tail and is able to run, jump, and climb is independent. If you come across a young deer, remember they are also very resilient in the wild but very difficult to rehabilitate once removed from their natural habitat – they often die from stress. People often mistakenly assume that a baby deer, called a fawn, is orphaned if found alone. Rest assured that the mother deer, the doe, is probably nearby. The doe will only visit and nurse her fawn a few times a day to avoid attracting predators. Roe deer give birth in May and June and fallow deer mostly have their young in June. Fawns can walk within an hour of being born. Unless you know the mother is dead, leave the fawn alone. Mother deer are wary of human smells; if you have already handled the fawn, take a towel, rub it in the grass, and then wipe down the fawn to remove all human scent. Then return the fawn to the place where you found him. If the fawn is lying on his side, or wandering and crying incessantly, he may be orphaned. If this is the case, call a wildlife rehabilitator in your area. But remember: a fawn found alone and quiet is okay. If a wild animal exhibits any of the above signs, you should immediately call one of the following local resources for assistance. You will find listings for most of these in your telephone directory, or try an online search. Prepare a cardboard box big enough to hold the baby. A shoe box works well for most song birds and small baby mammals, but some animals might need a larger box. Line the box with an old t-shirt or soft cloth and poke holes in the sides before you put the animal in the box. Wear gardening gloves if you are handling a small bird and leather gloves if you are handling a larger bird or a mammal. For most animals, it is best to use a towel to cover the animal and then gently scoop her into the box and close the lid securely. But if the animal is a baby mammal larger than a small rodent (squirrel), it is best not handle her at all. Instead, use the box itself to scoop her up. Do not give the animal food or water. He could choke, develop digestive problems, or drown. Many injured animals are in shock, and eating or drinking can make it worse. It is far more important to keep the baby warm and safe than to feed him immediately. If the rehabilitator is unable to arrive soon, he or she will instruct you on what else to do, if anything. Place the container in a warm, dark, quiet place—away from pets, children, and noise—until you can transport the animal. Transport the animal as soon as possible. While in the car, keep the carrier out of the sun and away from direct air conditioning or heat. Keep the car radio off and talking to a minimum. The Louth SPCA is a completely 100% voluntary organisation with no financial backing whatsoever. We are completely dependent on donations to do what we do. Please help us out in any way you can.